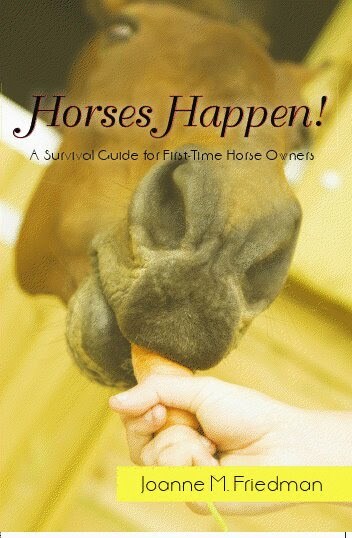 The article above should be required reading for all horse owners. No, I'm not launching a rant on our current style of horsekeeping. We know what we're doing wrong. But we're also doing some things right, and that's where this is going. Yes, horses were meant to graze 24 hours a day. Left to Nature, they live with their heads down and their lips busy ripping the heads off grasses. This serves several purposes. 1. The head-down attitude makes choking less of an issue. Try it. Your coffee might come out your nose, but it's unlikely it'll get stuck going down your throat. Horses are very fond of gravity. It works well for them. 2. Their eyes, which can see roughly 300 degrees around them, focus best at that angle. We like them to be standing up with their heads in Pretty Picture Position. They're not entirely in tune with that. They like to see what's coming at the level where their fragile legs are. If a distant sound catches their attention, they'll raise their heads so they can focus in the distance (barely), flip their ears in the direction of the sound, and snort to clear their nasal passages of all the stuff that dripped there while their heads were down so they can smell what's coming. It's a very effective way of using their bodies as they were designed. 3. Eating small amounts of forage all the time keeps their guts happy. They're less likely to develop ulcers if their tummies are constantly working on grass rather than on themselves. You never see a fat wild horse. Keep that in mind when you're doling out bits of hay and grain to that stomach-on-legs in your barn. 4. They are herd animals. They like other horses. They like to form clubs and associations and pick leaders and have meetings. They get lonely and strange without a social life, kind of like Uncle Curly who made odd noises in the basement where we weren't supposed to go. 5. Their legs and bodies stay reasonably fit from walking around. Try that, too. Walk around all day for a week. You can lie down for four hours, but not all at once. You'll look amazing, and you'll have far fewer Weekend Warrior-type injuries when someone makes you run a marathon and jump over barricades on Saturday afternoons. So, yes, there are issues with our trying to keep horses penned or stalled up for most of their day and night. Sometimes we can't help it. Sometimes it's all we've got available (and with all our meddling creating all those horses, sometimes it's just the best alternative). Sometimes the horses get hurt just standing around (a Horse World Mystery coming soon to a pasture near you) and need to be stuck away to heal. It's not all bad, and it's not all good. The grass is always greener on the lawn. But what we've also done (and this is why you need to actually read the assignment since by now you're feeling defensive and irritated) is add a dozen or more years to our domestic horses' lifespans. As the linked post clearly and accurately states, in the wild a mild colic, a pulled suspensory, a hoof injury, a poked eye--things we're so good at dealing with that we barely give them a second thought--would spell doom. Period. Death. Destruction. Being eaten by hungry predators. Being thrown out of the herd for unspeakable infractions of the rules and left to die alone. All of those things don't impact our domestic horses. We're caretakers. We take care. We also meddle where we shouldn't, but we do take care once the meddling happens. It's up to each of us to decide how we feel about this scenario. Do the horses get that we've given them long, healthy lives in exchange for their captivity? I don't know. Can we finally put the whole "Natural Horsemanship" concept to rest and just go with "I've got horses and I'm doing my best not to be mean to them"? That would be a really good thing. Without us, there wouldn't be so many horses. There are breeds today that, like in the dog world, wouldn't exist without human meddling. Is that a good thing? And there are more horses than we have homes for. That's a definite bad thing. But the horses with homes with good horsemen with some semblance of a normal horselife--lots of pasture space and appropriate social situtaions--are probably as happy as can be, and they probably feel secure in the knowledge that they're unlikely to be eaten by anything in the normal course of their days. We try. We could try harder. There's been plenty written about how positively a connection with other species affects the human psyche. Naturally, I'm going to belabor the concept. I pulled that section for highlighted because in my mind it gives one pause as to the reasons for horse ownership. Not surprisingly, there are a lot of people involved with horses. I wouldn't have guessed a number as large as 4.6 million, but what the hey! These stats are only a year old, so probably as accurate a reading as is available at the moment (especially considering how loathe horse owners are to give up their personals to surveyors and census takers). Equally unsurprising is the fact that about 5% are breeders. I would have expected that number to be higher given how many horses there are, but we're keeping them alive longer, so fewer replacements are needed. And that 5% is really doing a bang-up job of supplying babies, apparently. Continuing through the list, there's some overlap here and there, but the bottom line appears to be that over a million people here in the US are involved with horses for no apparent reason. They're not employees or breeders or competitors or service providers. They're just horse people. Why do you think that is? I'm going to hazard a guess that it's partly because we've grown up here with the horse story as our backdrop. The cowboys and even our own grandparents rode horses. Some of our recent ancestors used them on farms. The horse seems to be in our blood...sufficiently so that 1 out of ever 63 Americans is somehow involved with one or more horses. I'm going to divert you for a moment to a really fascinating Nova episode discussing Biophilia ("Love of Life", which translates into living being being inherently attracted to the very life force of other living beings). There's a bunch of nifty stuff in there about why we humans live where we live and how Biophilia determines that, but I'm going to take just a piece of it for my own purposes and propose that part of our fascination with pets of all varieties is biophilic in nature. We're drawn inexorably toward Nature, and we can't help but want to bond with other animals (or plants, as the case may be with some of my friends). 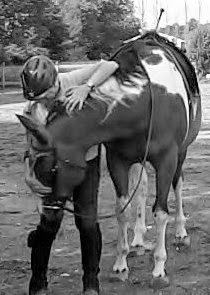 Last week I posited that some of us ask too much of our horses when we expect them to be our therapists instead of just our partners. We make them a sink for all our crazy and then wonder why they're neurotic and often afraid of us in ways that we can't understand. It's true that being around animals is good for the human mind (I'm not using "heart" , "soul", or "spirit", because I don't want to debate any of those concepts). Read the article I just linked and you'll get that it's a two-way street. We are a species (at least in the Developed Nations of Insanity) constantly in search of solace, and we don't mind spreading our pain to other creatures. It would behoove us in our quest for connection to understand that the other creatures are equally in need and would like very much for us to occasionally get outside ourselves and see their pain on their terms, without the chronic anthropomorphism that comes with egocentric human thought, and enter into a give-and-take. So my conclusion is that we love horses because they have a connection to the natural world and because we've been taught that they are part of our society. That explains the number of "otherwise involved" horse folks. I'd also like to conclude that we are reaching out to them for both our sake and theirs without our egos interfering. Sounds like a viable goal to me. This week, with the suicide of comedian Robin Williams a headline in every paper and on every news show, clinical depression is at the top of the concern charts. Well it should be. It's not the only mental illness we face, but it certainly is one that destroys lives. So when this blog post popped up on Horse Collaborative, I couldn't help but address the topic. Is your horse your therapist? There's no doubt that interacting with animals of many species has been shown to reduce stress levels in humans. Biophilia Theory strives to explain the connection. We are in many ways focused on interactions to help us, get us over a rough patch, or flat-out cure us of our ills. But is it too much to ask? If there's one thing we all know about horses, it's that they are very emotional creatures. There are horse owners who swear their animals can read their minds. I'm not an adherent of that concept. I get that horses, being pack animals, prey animals, and very visually tuned in to body language will naturally respond to that slower walk, hunched shoulder, or glum expression in ways that make it appear that they have a direct line to our emotional state. And in a way, they do. As pack/prey animals, it's in their best survival interests to read other animals quickly and with accuracy. A misread can be fatal. They're really good at it. Other animals are good at it for different reasons. Predators--dogs, cats, and whatever else you care to keep around you--also need to be able to get a quick read on the emotional state of the pack members. In their case, it's more an interest in keeping their position in the hierarchy and not aggravating the higher-ups who might see fit to attack and drive them away. Many predators are not solitary hunters and depend on the cooperative nature of the pack, pride, or other social grouping for their livelihoods. Keeping in mind that horses are very sensitive to our emotional state, is it wise to expect them to make the leap to understanding on a human level what we're feeling and try to ease our suffering? Probably not. It's very wise to take advantage of the calming effect of being around horses when we're in need of that, but it's a wise horseman who understands that his bad mood, depression, anxiety, upset, crankiness, psychotic break or other mental aberration, long-term or momentary, can have a negative effect on the very animals he's counting on for his support. 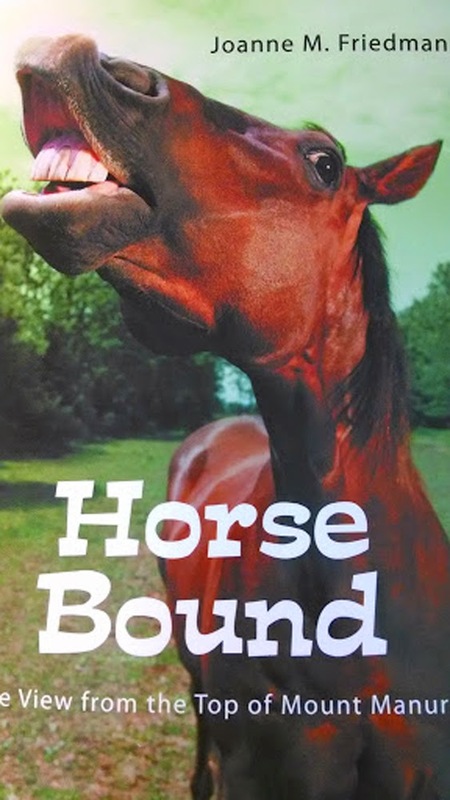 A recent study has made clear that a horse can derive negative emotions from his interactions with humans. So in the interest of doing what's best for our animals as well as ourselves, it behooves us to try to avoid interacting with them when we're in the throes of an episode of extreme emotional distress that might lead to our being less than sensitive toward our horse's needs. Yes, human mental illness is a heart-breaking, family-busting, sometimes fatal plague that we humans have to bear. And it's worth the effort to reduce our stress in any way we can. But even at those most terrible times, we need to remember that the effects of our actions when we're around our horses can be very long-lasting. Horses have great memories (just crinkle a piece of cellophane anywhere within earshot and see how quickly they remember that cookies come in plastic bags), and it's not fair to them to burden them with the memory of our often unpleasant behavior towards them when we're simply not fit for them to be around. Professional treatment will always trump do-it-yourself therapy. So if you feel out of control, find help. 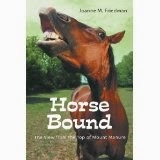 And if being around your horse can be of help without endangering your future interactions with him, then that's great. 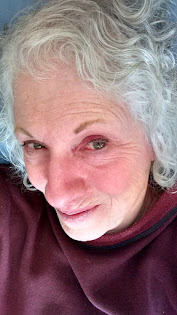 But if a bystander or friend comments that you're awfully overwrought and your hose is tap-dancing in the barn as a result, listen and heed and back away. You can return another day with the remnants of your sadness and emotionality, and he'll still be there to help you deal with the leftovers. Your smile gives you super powers. How cool is that? This review of research on smiling is about as much fun as I've had lately, and it's worth watching more than once so you really get what this man is saying. Smiling is critical to happiness and success. Why bring this up in the middle of summer when riding time is at its peak and depression relatively ebbs in the sun? Because we all need super powers. Children smile more than 400 times a day, and we can't help but smile back at them. "Smiling is evolutionarily contagious and it surpresses the control we usually have on our facial muscles." Whoa! Loss of control! How scary is that? For horsemen, unfortunately, it can be very scary indeed. Part of the reason we dress our horses in leather and chains and use leverage devices is that we crave control over the unknown, and a horse's mind and intentions are pretty much unknown to a human. So we overdo the effort to control. I was at a horse show last night, and as usual I noted that the riders waiting to enter the arena for their classes were looking pretty grim. In fact, it was notable when one little girl in a leadline class entered the ring laughing and swinging her arm and leaning back in her saddle showing all sorts of relaxation and pleasure. The contrast with the only other rider in the class, who had a pasted-on smile that looked as if it were masking pain, was enough to make me laugh. And I did laugh, which made the pain of sitting in the heat watching the class far more bearable. So I got to thinking, what if horsemen experimented with honest, flat-out smiling before every encounter with their animals? I'm not talking about faking it, though there is ample research to prove that even a faked smile will make you feel better. I'm talking about approaching your horse with the same real, relaxed pleasure you reserve for a favorite friend or relative. You open Great Aunt Elizabeth's door with real happiness in your heart, and your smile reflects that. 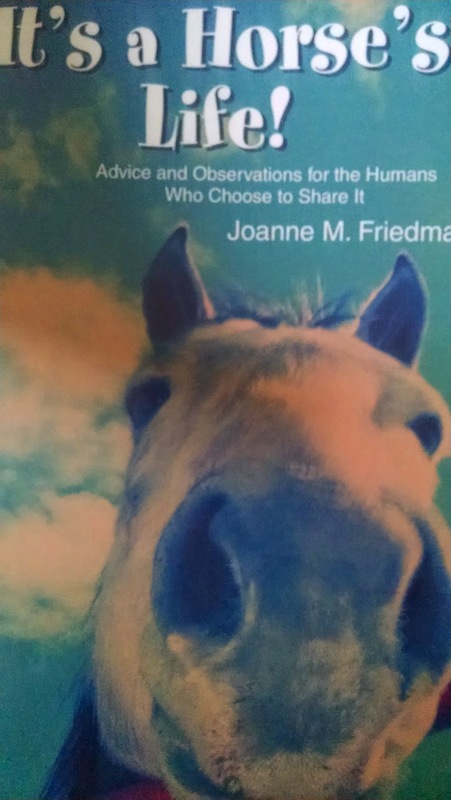 What if you opened your horse's stall (or grabbed him out of the pasture where he was having fun till you came along) with the same light-heartedness? This will take some effort. 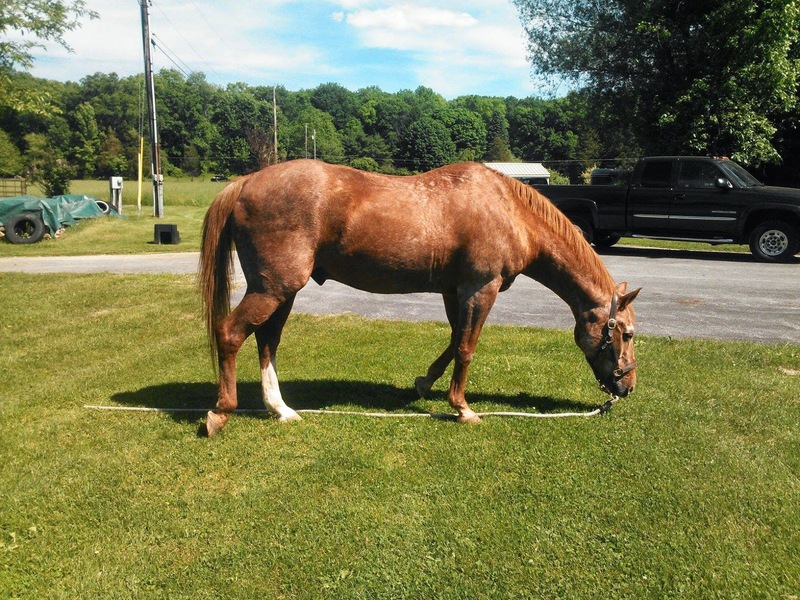 Try keeping in mind that your horse doesn't need to be there, and one day he won't. Find something fun to try today with that animal, even if it's teaching him a silly trick or sitting on a rock in the pasture with a book till he stops running around you like a Dervish and comes to see why you're not chasing him. Stop seeing your interactions as routine. Hard to believe, I know, but most horses don't need to be ridden. Yes, really. They're just as happy standing around with their friends (or even alone) as being with you. So try thinking of that old guy in the field as a toddler you need to jolly up before he starts to cry and smashes your favorite vase in anger. Be happy he's there and you're there and it's a day unlike the one before or the next one coming.